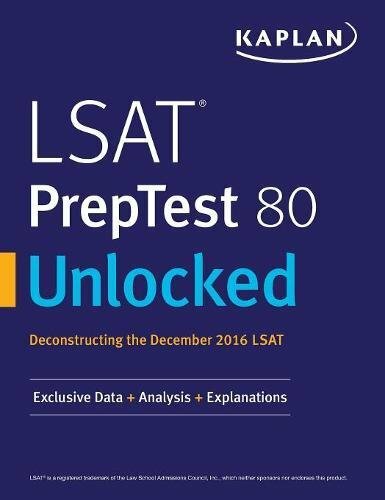 Deconstructing the December 2016 LSAT Taking an official LSAC PrepTest is great practice for the LSAT, but reviewing a practice test afterward is where you really improve. Supercharge your LSAT prep with Kaplan's LSAT PrepTest 80 Unlocked. * Complete explanations for every question and answer choice * Sample Logic Games sketches and Reading Comprehension roadmaps * The Inside Story: Exclusive data on question difficulty and student performance * 8 Can’t-Miss Features of PrepTest 80 * PrepTest 80 In Context: Comparison of PrepTest 80 to recent LSAT trends * Glossary of LSAT terminology Every question and answer choice is discussed, along with detailed strategies for racking up points and exclusive data on student performance identifying the most difficult questions and how PrepTest 80 compares to recent LSAT trends. In addition, you’ll see sample sketchwork for logic games and sample roadmaps for reading comprehension passages. If you are new to the LSAT, a glossary offers definitions for terminology that will help you to think like the testmaker. *PrepTest 80 not included. LSAT® is a registered trademark of the Law School Admission Council, which neither sponsors nor endorses this product.